New Delhi, 26 July 2017: Based on the report of a High Level Committee and in consultation with the Zonal Railways, 202 stations have been identified as sensitive for the purpose of installation of an Integrated Security System (ISS) to strengthen surveillance mechanism at these stations. ISS comprises of Close Circuit Television (CCTV) Cameras, Access Control, Personal and Baggage Screening System and Bomb Detection and Disposal System. 102 Railway stations have already been covered with CCTV surveillance system under ISS. In addition, 151 Baggage Scanners, 32 Under Vehicle Scanning System (UVSS) and 88 Bomb Detection & Disposal items have also been provided under ISS. Issues concerning availability of eligible vendors, inspection of items, availability of budget, etc. were initially raised by Zonal Railways. These issues have since been addressed and all the Zonal Railways have been advised to ensure speedy implementation of ISS at all the identified sensitive stations. Prevention of crime, registration of cases, their investigation and maintenance of law and order in Railway station premises is the statutory responsibility of the concerned States, which is being discharged by them through Government Railway Police (GRP). 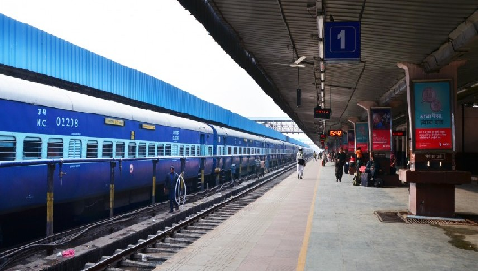 Railways through Railway Protection Force (RPF) are supplementing the efforts of the Government Railway Police to strengthen security over Railways. To redress security related complaints of passengers, Security Helpline numbers 182 and 1800-111-322 have been made functional over Indian Railways. A total of 29906 security related complaints were received at Security Helplines since the year 2014 upto June, 2017 and follow up action was initiated accordingly. Zone wise position is Appended. No suggestions have been received. It is pertinent to mention that strengthening and upgradation of security infrastructure is an ongoing process. All out efforts are being made by Railways to supplement efforts of States to improve security at railway station premises, including stations identified as sensitive under Integrated Security System (ISS). Measures initiated to strengthen security includes provision of CCTV cameras for round the clock surveillance at important stations, operationlisation of Security Helplines Number 182 and 1800-111-322, networking of RPF posts and Security Control Rooms, etc. ISS comprises of Close Circuit Television (CCTV) Cameras, Access Control, Personal and Baggage Screening System and Bomb Detection and Disposal System. 102 Railway stations have already been covered with CCTV surveillance system under ISS. In addition, 151 Baggage Scanners, 32 Under Vehicle Scanning System (UVSS) and 88 Bomb Detection & Disposal items have also been provided under ISS.